Andy suffers from alopecia areata which is also known as “spot baldness”. He is in his early thirties and is in pretty good health. So to say he is “suffering” may be a bit extreme, as there is no physical pain associated with this condition – known for making patches of hair go missing on the scalp. Andy’s emotional anguish is another story, altogether. Andy is actually the younger brother of a high school friend of mine. He explained that shortly after graduating from high school, he noticed that small parts of his head were “shining” through his curly locks. So Andy decided grow his hair even longer, to hide the patches. He figured the patches would eventually grow back in. Unfortunately, the bald patches only grew in size. Strangely, new ones would form while old ones seemed to get smaller. It was confusing for Andy, but not something he became very concerned with until he visited a specialist. After learning about alopecia areata, Andy decided to go to a hair clinic to invest in a hair growth program that inevitably failed. “I guess I was destined to be bald,” commented the usually good-natured Andy. That’s when laser hair removal in Kelowna became Andy’s next option. You see, Andy began shaving his head after realizing that the bald patches wouldn’t properly grow back in. His problem, however, was that the areas of his scalp where no hair grew were visibly evident, even when his head was shaved clean. In order to garner an evenly smooth scalp, Andy figured the rest of his hair would have to go permanently as well. He consulted a skin care professional who admitted that laser hair removal wasn’t often considered a way to deal with alopecia areata – but was a pretty good compromise nonetheless. “Hey, if you can’t beat ’em, join ’em,” remarked Andy about the “force” that took his hair. Laser Hair Removal is pretty much what it sounds like. A laser is used to target hair follicles to permanently damage them so that no new hair growth occurs. This actually worked wonders for Andy as he has dark hair and fair skin. Dark hair, it seems, absorbs the most heat energy, so it allows for more successful damage of the hair follicles. Because dark skin absorbs heat energy much the same way, it can detract from the effectiveness of the laser treatment. This situation was a win-win for Andy. 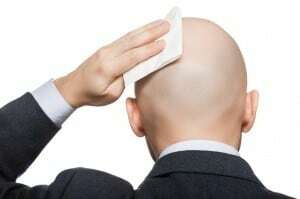 His biggest concern, of course, was that his shaved head would still look patchy as dark follicles on a light skinned scalp made for what he simply called a “mess”. Andy is quite happy with the results, however. Laser Hair Removal is most often used to remove unwanted or excess hair in such areas as the armpits, arms, legs, back or even the bikini line. If you have any questions about Laser Hair Removal, be sure to contact a skin care professional near you.